December 3, 2013–Today government officials and corporate lobbyists will meet for the 9th World Trade Organization (WTO) Ministerial. It is exactly 14 years after the global 1%’s “plan A” to use the WTO further concentrate their power in wealth collapsed on Dec 3, 1999 amidst a “state of emergency” suspending basic rights, teargas in and National Guard troops in the streets and jails full of hundreds of people (and surrounded by hundreds more supporters) from North Americas emerging global justice movement. Fourteen years later, the value of looking back to the streets of Seattle–a moment when North American movements stepped up shoulder to shoulder with other global movements– is to see how people power can work and to draw lessons for today. I found the best analysis of the week long street and information battles was written by Washington State researcher and organizer Paul deArmand in his in-depth analysis, Black Flag Over Seattle, which was later republished as part of the book Networks and Netwars. Paul passed away this year after an amazing and full life. Thank you Paul for your good, hard work and sharp thinking. Here is an obituary–“A Giant Passes”– from his colleagues at the Cascadia Weekly. Solnit: You wrote ten years Ago in Black Flag Over Seattle: “..governmental authorities may have learned more from the Battle of Seattle than the activists did. What lessons should activists have learned? deArmond: At the time, the obvious one was: How did this happen and where does it take us. The result in Seattle was some half-baked protests against Microsoft. Evidently on the basis that corporations were bad and Microsoft was a big corporation. At the time I wrote this, the obvious lesson to me seemed the unexpected political power of ad-hoc, even accidental, coalitions. But the tenor in the new left energized by Seattle was one of inward focus and a quest for “authenticity.” It was a rejection of the political in exchange for the experience of protest. Probably the biggest unlearned lesson was the failure to appreciate the crucial role of the revolt of the Seattle police against their own leadership, the mayor and the chief of police. That was a crucial ingredient that was never to be repeated. Law enforcement learned this lesson well and the protests that followed Seattle were all examples of police acting under unified command. The protest movement kept trying to recreate the “spirit of Seattle” in an environment that would never again present them with an internal power struggle inside the police. So the lesson that should have been learned was about the sensitive dependence on initial conditions. Solnit: You explain network conflict or “netwar”: “The Direct Action Network’s strategy is a classic example of “netwar” conflict. The essence of netwar is the emerging forms of conflict in which one or more of the major participants consist of networks, rather than institutions. The central feature of informational conflicts is the struggle for understanding and knowledge, as opposed to more traditional conflicts which focus on controlling territories or resources. One of the first full-blown manifestations of netwar was the Zapatista conflict in Chiapas. The networked intervention of international groups placed very real limits on the use of violence by the Mexican government in suppressing the insurrection. Netwars are fought by networks; collections of groups and organizations guided by non-hierarchical command structures which communicate through “all-points” communications channels of considerable bandwidth and complexity which had global reach via the internet. Institutions, such as police and the AFL-CIO, tend to depend on narrow communications channels which are highly centralized and hierarchical. Networks operate by “swarming” their opponents, approaching stealthily and from many directions in offense and reacting much like anti-bodies in defense. In netwar, the line between offense and defense can be blurred, leaving opponents unclear about what is occurring and how to respond. Throughout the protests, the Direct Action Network were able to offensively swarm their opponents repeatedly, as shown by the seizure of key intersections on Tuesday and the easy penetration of the “no-protest” zone on Wednesday. The anti-body defense was shown when crowds moved towards police attacks or mass arrests and when numerous groups within the AFL-CIO rally and parade successfully resisted efforts by the union leadership to keep them from supporting the DAN blockade of the WTO convention site. The network form of organization is particularly robust in the face of adversity. The decentralized command and control structure allows rapid shifts of strategic targeting, resistance to “decapitation” (attacks which target leadership), and the disruption of communication channels. All three of these feature were present during the WTO protests. If you had only five minutes to brief pro-democracy activists about network organizing and conflict, what are the key principles we need to understand in order to win? deArmond: There’s nothing about network social organization that guarantees winning. The most dynamic movements will have multiple centers of power, often in competition with each other for members and resources, but all moving towards a shared general goal. Premature attempts at centralization are counterproductive, despite every nexus feeling that their centrality is necessary for the movement to survive. For networks to thrive in a hostile environment, the basic rule is grow or die. This means recruitment is the lifeblood. Commitment often comes as the result of a conversion process, but successful recruiting usually is the result of people gaining by or from becoming part of something larger than themselves. Purity tests are anathema to recruiting. This was the pitfall of the cult of authenticity. In network building, the energy comes from information. At meetings and conferences, distributing contact lists of all participants to all participants is a useful tool. The idea is to build a network, not exalt a particular node of the network. That includes giving away the information people can use to build their own nodes, perhaps for their own purposes. If these sometimes temporary, ad-hoc groups contribute to the direction of the movement, all the better for everyone. One very important aspect of networks is the possession of topsight. This is the overall and encompassing understanding of the movement, its opposition and the environment in which the movement acts. This is objective knowledge, not a projection of ideology onto reality. If you hear someone say “We know all about that,” you can pretty much assume all they know is the labels. The lack of topsite becomes what Napoleon called “making pictures of the enemy.” Test the facts, challenge assumptions, stick to your guns and do research to find out what’s really going on. Research to support prior assumptions or bolster a fantasy is all too common. Topview gives the information necessary for analysis and analysis can lead to successful strategy. The most shocking example of a failure of topsite on the left is the so-called “911 Truth Movement.” The mere fact that this sort of delusion captured a large portion of the anti-war movement was a diagnostic sign of weakness and potential collapse. Networks thrive on recruitment and information. Communication (and low communication cost) is essential to building and maintaining a network. It mostly consists of providing the means and models for people to continue building the network on their own. Topsight enables strategy and maneuver toward achievable goals and shows how to frustrate the opposition. Solnit: Miguel Pickard, of the Center for Economic and Political Investigations of Community Action in Chiapas, Mexico wrote about governments preparing to counter our movement networks: “there is in fact worry because the networks of social organizations have had some notable successes that have made the executives in certain economic organizations blink nervously. The implicit threat is obvious: those pesky ants, organized in networks and undertaking “netwars”, have stopped, even briefly, that steamroller called neoliberalism. Therein lies the threat for Washington: the prevailing economic model is being threatened by ants. One of Arquilla and Ronfeldt’s [in Networks and Netwars]main recommendations to governments is that to break up networks, they must themselves become more like networks. How are governments and markets countering network organizing and movements for positive social change and what can we do to avoid being contained? deArmond: Brian Nichiporuk’s monograph is just ammunition for future budget battles. The fact that he could foresee a role for the Army in interfering with the internal political process is disturbing, but not very — considering that the primary mentality about military funding is a bandit mentality anyway. So I wouldn’t waste too much time on that monograph. The Situationist notions of spectacle and how the establishment goes about “recapitulating the spectacle” captured most of the dynamic. Interesting group, the Situationalists. I think Naomi Klein had a lot to say about commodifying rebelling and turning into something people buy at Wal-Mart. That’s probably the biggest problem. It’s also what produced the “authenticity” navel-gazing. Movements succeed by becoming pluralities. It’s not becoming your opponent, it’s your opponent becoming you. One sign of a successful movement is that it fossilizes as establishment institutions. Not a bad thing. The EPA is the DNA of the ecology movement replicating itself in the host of the federal government. A successful insurgency end up in the hands of people wearing clean and pressed uniforms. “Avoid being contained” is an interesting phrase. It suggests getting used to growing, changing and evolving. Perpetual struggle isn’t a very inviting world. Evolution happens in spurts — punctuated equilibrium. Networks are mobile, fluid and adaptive. Getting contained could mean spreading values widely enough to put the establishment through some evolutionary changes of their own. Like the DNA of ecology. Health care seems like one issue that could use some grassroots agitation. Solnit: You wrote: “The most profound outcome of the WTO protests is the appearance of the netwar construct in American politics. 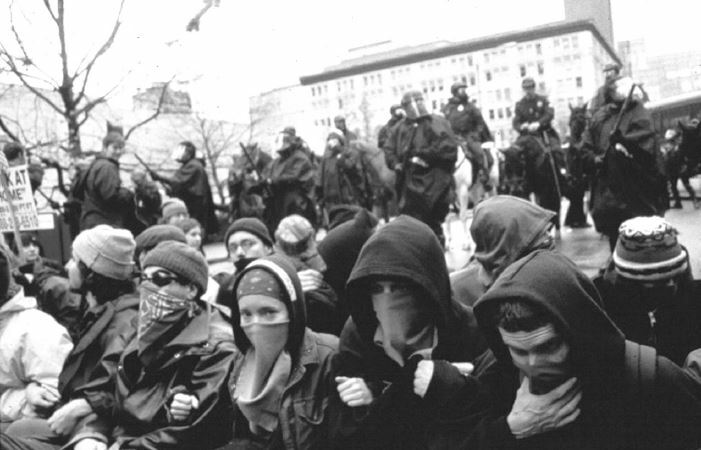 The “Battle in Seattle” was fought not only in the streets, but also in the infosphere. The WTO protests were the first to take full advantage of the extremely dense and wide-reaching alternative media network which uses the internet. The WTO protests were the Chiapas insurrection come to America. Like the Zapatista netwar, the conflict was one of networks versus markets. Netwar is nothing new as a form of conflict. It is a new concept, but the underlying reality of it has been around for a long time. What is new is the richer informational environment which makes the organization of civil (and uncivil) society into networks easier and more efficient. How has netwar in American Politics and the informational environment changed in the last decade? deArmond: We’ve already seen it in the political shift started by Howard Dean (whose campaign was very network savvy) and brought to fruition by the election of Obama. The 2010 election will tell if this is truly a realignment. If that turns out to be the case, then the WTO protests have yeilded some tasty fruit. The infosphere will continue to fragment and diversity with the inevitable fall in the costs of communication. The Obama campaign showed the way forward to campaign finance reform — lots of small donations. I read somewhere that Hubert Humphrey’s 1968 presidential campaign got 80% of its financing from 12 individuals. If that was true then, it certainly not going to be how politics gets funded in the future. So things are decentralizing a bit. There’s still a long way to go. There doesn’t seem to be any notable heft to the left wing (such as it is) in American politics. That might change, but it’s hard to see any clear sign of it.